Renal Ewing sarcoma (ES) is a rare malignant tumor characterized by fusion of the EWSR1 gene with a member of the ETS family of oncogenes, arising at a specific chromosomal translocation. 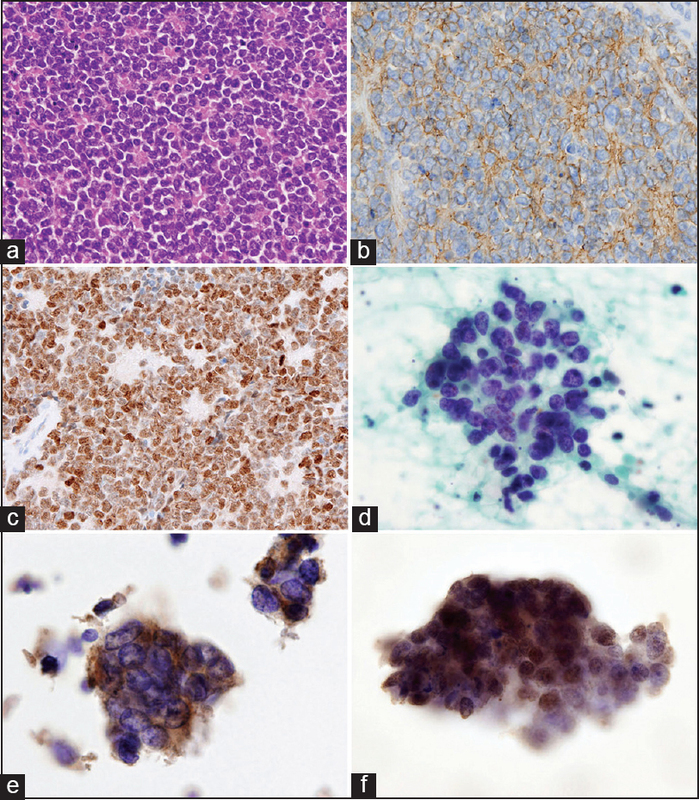 Diagnosis of ES can be problematic, especially from cytological or small bioptical specimens because the differential diagnoses comprising a diverse group of small round blue cell tumors (SRBCTs). 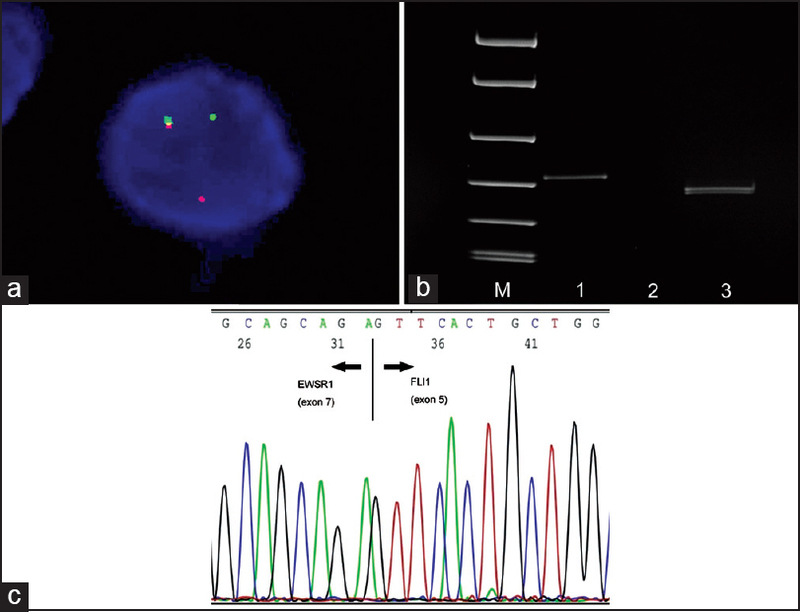 We report a case of primary renal ES in a young male, which had a t(11;22) (q24;q12) chromosome translocation encoding a type2 EWSR1/FLI1 fusion transcript. The tumor cells showed diffuse cytoplasmic immunoreactivity for CD99 and diffuse nuclear immunoreactivity for NKX2.2, an important oncogenic transcriptional target of EWSR1/FLI1, not only in the histological, but also in the cytological specimens. From the results of this case, we speculate that NKX2.2, in combination with CD99, may be a useful immunocytochemical marker to distinguish renal ES from other SRBCTs of kidney. Renal Ewing sarcoma (ES) is a rare small round blue cell tumor (SRBCT), which predominantly affects adolescents and young adults. Cytogenetically, renal ESs commonly harbor characteristic chromosomal translocations, more than 90% of which are reciprocal translocation t (11;22) (q24;q12), resulting in an EWSR1/FLI1 fusion transcript. , We here report a case of renal ES with a t (11;22) (q24;q12) chromosome translocation encoding an EWSR1/FLI1 fusion transcript. The tumor cells in both histological and cytological specimens showed diffuse and strong nuclear immunoreactivity for NKX2.2, an oncogenic transcriptional target of EWSR1/FLI1, which may be a useful immunocytochemical marker for renal ES harboring EWSR1/FLI1 fusion transcript. A 35-year-old male presented with a 2-week history of abdominal pain and hematuria. Computed tomography revealed a large mass (15.5 cm × 13.5 cm × 10 cm) replacing the right kidney and expanding into the right inferior vena cava, as well as a small metastatic nodule in the right lung. A needle biopsy of the renal mass showed mixture of sheets and Homer-Wright rosettes composed of small round cells [Figure 1]a. PAS staining demonstrated the presence of variable amounts of diastase-digestible glycogen. Immunohistochemistry revealed that the tumor cells showed diffuse membranous and cytoplasmic expression of CD99 [Figure 1]b, and diffuse nuclear NKX2.2 expression with strong intensity [Figure 1]c. We interpreted the tumor as renal ES and the patient underwent curative resection of both of the primary and the metastatic lesion. Papanicolaou staining of touch imprint smears of the lesion showed a well dispersed uniform population of small round cells [Figure 1]d. The tumor cells had vesicular and clear cytoplasm of which rim was distinct. The nuclei were round to oval, with irregular borders, coarsely granular chromatin and inconspicuous nucleoli. Mitotic figures and apoptotic figures were frequently found. Rosette formation was rarely observed. In immunocytochemistry, the tumor cells showed diffuse cytoplasmic expression of CD99 [Figure 1]e; diffuse nuclear expression of NKX2.2 with strong intensity [Figure 1]f. Fluorescence in situ hybridization (FISH) was performed using probes made from BAC clone; RP11-945M21 for EWSR1 and RP11-75P14 for FLI1. Probe DNA was labeled by nick translation kit using: SpectrumOrange (Abott) for EWSR1 and SpectrumGreen (Abott) for FLI1. The touch imprint specimen revealed the presence of t (11;22) (q24;q12) translocation [Figure 2]a. Reverse transcription polymerase chain reaction (RT-PCR) using the removed tumor specimen could amplify the fusion transcript [Figure 2]b, following sequence analysis revealed type 2 EWSR1/FLI1 fusion that involved EWSR1 exon 7 fused to FLI1 exon 5 [Figure 2]c. Nevertheless of six cycles of intensive chemotherapy, including cyclophosphamide, vincristine, doxorubicin, the tumor relapsed, and the patient died of the disease 27 months after the operation. In the present study, the ES cells harboring EWSR1/FLI1 fusion showed diffuse nuclear expression of NKX2.2 with strong intensity. Although, the final confirmation of ES does include the demonstration of the translocation by molecular methods, immunostaining of cytological specimens with the combination of anti-CD99 and anti-NKX2.2 may be useful to distinguish renal ES from other SRBCTs of kidney. Eble J, Epstein J, Sesterhenn I, Sauter G. Pathology and Genetics of Tumours of the Urinary System and Male Genital Organs. 3 rd ed. Lyon: IARC Press; 2002. p. 83-4. Jimenez RE, Folpe AL, Lapham RL, Ro JY, O'Shea PA, Weiss SW, et al. Primary Ewing's sarcoma/primitive neuroectodermal tumor of the kidney: A clinicopathologic and immunohistochemical analysis of 11 cases. Am J Surg Pathol 2002;26:320-7. Kumar R, Gautam U, Srinivasan R, Lal A, Sharma U, Nijhawan R, et al. Primary Ewing's sarcoma/primitive neuroectodermal tumor of the kidney: Report of a case diagnosed by fine needle aspiration cytology and confirmed by immunocytochemistry and RT-PCR along with review of literature. Diagn Cytopathol 2012;40 Suppl 2:E156-61. Shibuya R, Matsuyama A, Nakamoto M, Shiba E, Kasai T, Hisaoka M. The combination of CD99 and NKX2.2, a transcriptional target of EWSR1-FLI1, is highly specific for the diagnosis of Ewing sarcoma. Virchows Arch 2014;465:599-605. Riggi N, Cironi L, Provero P, Suvà ML, Kaloulis K, Garcia-Echeverria C, et al. Development of Ewing's sarcoma from primary bone marrow-derived mesenchymal progenitor cells. Cancer Res 2005;65:11459-68. Smith R, Owen LA, Trem DJ, Wong JS, Whangbo JS, Golub TR, et al. Expression profiling of EWS/FLI identifies NKX2.2 as a critical target gene in Ewing's sarcoma. Cancer Cell 2006;9:405-16. Mhawech-Fauceglia P, Herrmann F, Penetrante R, Beck A, Sait S, Block AM, et al. Diagnostic utility of FLI-1 monoclonal antibody and dual-colour, break-apart probe fluorescence in situ (FISH) analysis in Ewing's sarcoma/primitive neuroectodermal tumour (EWS/PNET). A comparative study with CD99 and FLI-1 polyclonal antibodies. Histopathology 2006;49:569-75. Yoshida A, Sekine S, Tsuta K, Fukayama M, Furuta K, Tsuda H. NKX2.2 is a useful immunohistochemical marker for Ewing sarcoma. Am J Surg Pathol 2012;36:993-9. Terry J, Saito T, Subramanian S, Ruttan C, Antonescu CR, Goldblum JR, et al. TLE1 as a diagnostic immunohistochemical marker for synovial sarcoma emerging from gene expression profiling studies. Am J Surg Pathol 2007;31:240-6. Jagdis A, Rubin BP, Tubbs RR, Pacheco M, Nielsen TO. Prospective evaluation of TLE1 as a diagnostic immunohistochemical marker in synovial sarcoma. Am J Surg Pathol 2009;33:1743-51.